The Grumman S2F Tracker was the first carrier-borne aircraft designed to combine the roles of submarine hunter and killer, roles which had previously been carried out by separate aircraft. The prototype first flew in 1952 and the production variants entered service in 1954. It carries a crew of four, two pilots and two rear sensor operators. The aircraft was manufactured under licence in Canada and has seen service in many other foreign air arms. This title contains two flight manuals for the S2F Tracker, has been scanned from the original flight manuals and retains any colour pages. 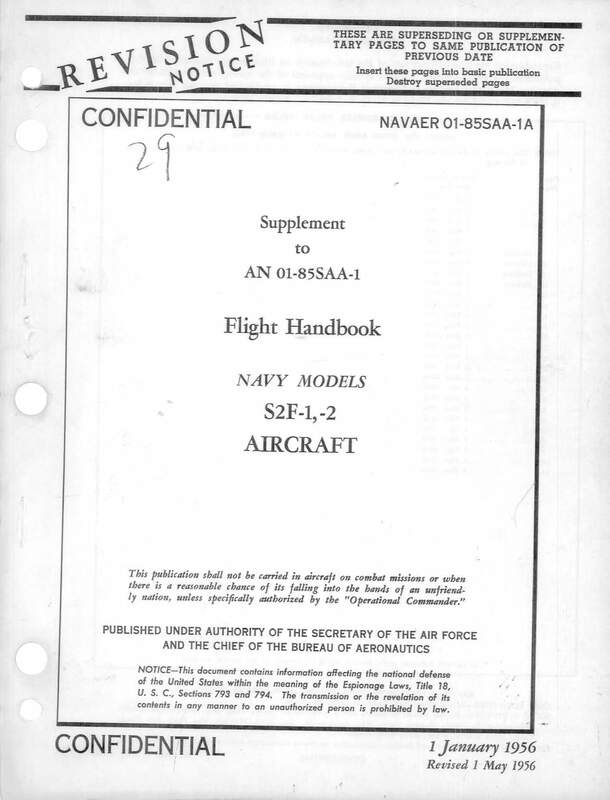 US Navy Flight handbook for the S2F-1,2 AN 01-85SAA-1, dated 1/1/56 revised to 1/5/56, with approx 139 pages. US Navy Confidential Supplement to the Flight handbook for the S2F-1,2 AN 01-85SAA-1A, dated 1/1/56 revised to 1/5/56, with approx 114 pages. US Navy NATOPS Flight Manual for the S-2D S-2E AN 01-85SAD-1, dated 1/6/66 with approx 439 pages.